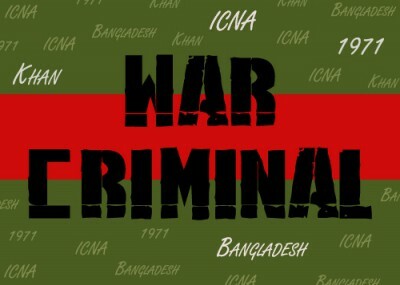 A former leader and current member of the Islamic Circle of North America (ICNA) may soon be charged with crimes stemming from activities during the 1971 Bangladesh war of independence. The country's International Crimes Tribunal reportedly will indict Ashrafuz Zaman Khan for the suspected murder of pro-independence intellectuals. The war divided Pakistan and Bangladesh into two separate nations, but not before Islamist unionists and the Pakistani army launched systematic massacres of civilians and intelligentsia supporting independence. Khan is alleged to have been an active participant and to have even functioned as an executioner. Ironically, Khan gave a speech last April during an anti-war rally in New York, in which he decried the harm done by the war on terror. Khan has been active in ICNA, a group that bills itself as "a leading grassroots organization in the American Muslim community." He served as secretary general in 2000 and vice president in 2001, and was the president of the ICNA New York chapter when he made the speech. But ICNA itself has had a checkered past. It was founded by activists from the extremist organization Jamaat-e-Islami, the South Asian equivalent to the Arab world's Muslim Brotherhood, which has expressed support for violent jihad against American forces and other non-Muslims in Iraq, Afghanistan, Palestine and elsewhere. The Jamaat also salutes the jihad of groups like Hamas, Hizballah, and Hizbul Mujahideen in Kashmir. ICNA's constitution is largely copied from Jamaat-e-Islami Pakistan's founding documents, including the goal of promoting Islam as an alternative to Western society. Its education platforms teach books by Jamaat founder Syed Abul Ala Maududi, which are banned in Bangladesh for reasons of incitement. And the group is suspected of inciting young members to participate in foreign jihads, as was emphasized in a 1997 article in the group's magazine. Khan's alleged crimes in Bangladesh came as part of the pro-Pakistan al-Badr militia and in conjunction with the local Jamaat-e-Islami branch. Bangladesh has indicted national Jamaat leaders for their roles in the 1971 killings, proscribed books by the group's founder for their "militancy and terrorism," and repeatedly threatened to ban the organization as a whole. Groups like the Secular Voice of Bangladesh claim Khan had a role in organizing the killings, and say his record is well-documented in his personal diary. They claim Khan was a chief executioner for the al-Badr force, personally killing seven Dhaka University teachers in the city of Mirpur. The names and addresses of other intellectuals who were murdered or went missing in 1971 reportedly are recorded in the diary. Khan's driver during the massacres, identified as Mr. Mofizuddin, is said to have already given testimony against him. The news hasn't escaped the ears of American officials, who asked the Bangladeshi government for clarifying information in 2008. According to the Secular Voice of Bangladesh and other Bangladeshi news sources, Eli Rosenbaum, former chief of the Office of Special Investigation in the Justice Department, put in the request. Rosenbaum hunted Nazi war criminals in the United States, often using deportation as a tool to send the accused back to their home countries to face justice. Although the United States does not have an extradition treaty with Bangladesh, positive confirmation of the information could result in the revoking of Khan's American citizenship and deportation to Bangladesh for trial. It is not known if or when the Bangladeshi government responded to Rosenbaum. ICNA has not offered comment about the Khan's alleged crimes, nor his role in the organization. However, Bangladeshi charges against him will certainly lead to a debate about deporting the Imam from the U.S. and stripping him of his citizenship.